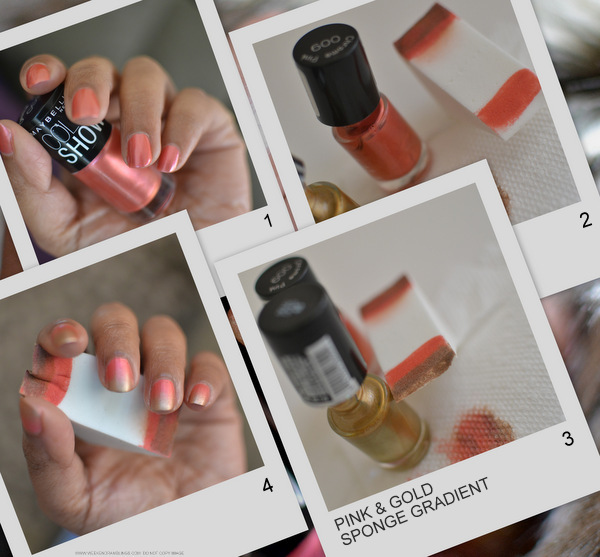 Sponge-gradient nails are quite popular all over the internet, and a simple Google search will throw up quite a few fabulous tutorials done by some amazing nail polish bloggers. This is just a mish-mash of all the instructions - definitely not my own genius at work here! In a nutshell, you apply a base color (I have used Chrome Pink), then use a sponge to dab a mix of the base color and your chosen gradient color (I have used Bold Gold) to get an ombre or dip-dyed effect on the nails. You can use multiple colors, but I have kept it simple with just these two colors. 1. Apply 2 coats of base color. The color I have used - Maybelline Color Show Chrome Pink - is a metallic pink with a hint of coral to it, but because of the spectacular lighting in my room it's looking orange/coral here! Anywho, apply the polish and wait for it to dry completely. 2. Apply a thick stripe of Chrome Pink on a makeup sponge as shown in the photo above. I have used a dry sponge, and the polish will get absorbed into the sponge very quickly. Some bloggers recommend using a wet sponge to avoid this, but I prefer it this way. 3. 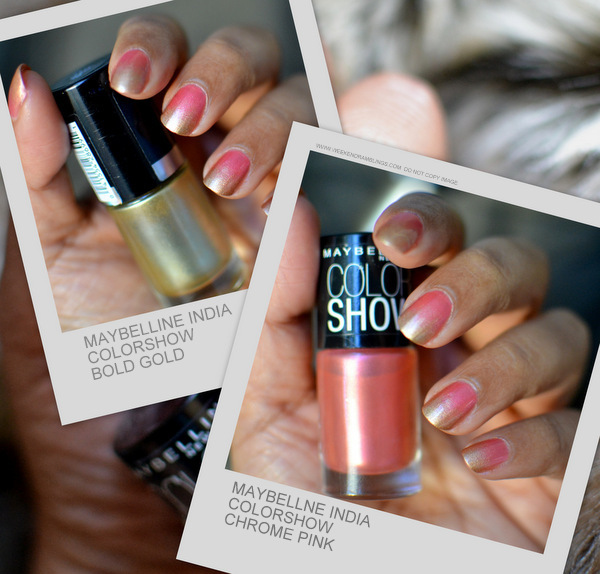 Apply a stripe of Maybelline Color Show Bold Gold slightly overlapping the previously applied pink stripe. Dab the sponge once or twice on paper to check the colors before actually applying it on your nail - also helps take off any globs of polish that maybe there on the sponge. 4. Dab the sponge on to the nail, keeping the gold stripe towards the tip of the nail. Repeat this 3 or 4 times, moving the sponge just a teeeny bit higher each time, to get a more uneven appearance to the gradient and avoid a sharp line. If you are quick with the dabbing/sponging, you can do 2 nails (or more, perhaps) at a time before the sponge dries out. I am slower and also because I use a dry sponge, I have to do the whole stripes-on-sponge routine fresh for each nail. Once all the nails are done, clean up any polish from around the nails and seal with a top coat. I have used a glossy top coat on my nails, but next time, I will try this out with a matte coat. Love this combination of pink and gold. It seems simple enough for me to try out. It's very easy, Dollie - do give it a try. LOVELY DONE. NICE COMBINATION TOO. ANY SUBSTITUTE FOR THE SPONGE RADHIKA? Hi Varsha! Not really a substitute, but you could use any sponge - not necessarily a makeup sponge. The big bathroom sponges that we get in India would work pretty well too..just tear/cut out a small piece and use. Another option you could try are the sponge-tip applicators that come in a lot of eyeshadow palettes. You might have to modify the idea a bit and apply only the gold color (or whatever color you want to sponge on) and dab that along the nail edge. I think it should work too.